Take the term, “thong” – in Australian slang this means flip-flops, a meaning lost on someone not familiar with Australian slang, as it means underwear in most other countries. This is where bots, specifically chatbots come into play. They allow users to interact with computer systems through natural language, and they facilitate the learning and training of, amongst others, language, intention and understanding through machine learning and cognitive APIs. It is important for the chatbot to be able to leverage trained understanding of human language so that it knows how to respond to the user request, and what to do next. And so, when “John” (who you will meet below) interacts with the computer with the question “do you sell thongs?” the computer understands what it means within the correct context. Five years ago, embarking on a project to build an intelligent chatbot would have been an exercise involving an array of specialists assisting in the interpretation of natural language processing. It wasn’t something that was affordable for companies other than those in the Fortune 500. How times have changed – with the development of natural language processing toolkits and bot building frameworks such as wit.ai and api.ai. these tools have allowed web application/lambda developers to have the means to create intelligent yet simple chatbots without the requirement of a natural language processing specialist. There are different options available to build a chatbot, but in this article, we investigate the Microsoft bot framework and introduce our own EVA (the Exposé Virtual Agent) – a chatbot built within the Microsoft bot framework. But first, let’s have a quick look at why businesses should care (i.e. what are the business benefits)? It’s mostly about your customer experience! 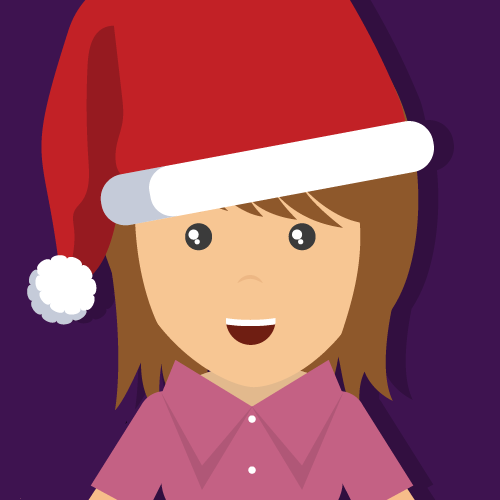 We have all dealt with customer call centres. The experience can be slow and painful. This is mainly due to the human staff member on the other side of the call having to deal with multiple CRM and other systems to find the appropriate answers and next actions. Chatbots are different. Providing they can have a conversation with the customer, they are not limited by technology as they have the ability to dig through huge amounts of information to pick out the best “nugget” for a customer. They can then troubleshoot and find a solution or even recommend or initiate the next course of action. Let’s look at how this can be achieved with the Microsoft Bot Framework. 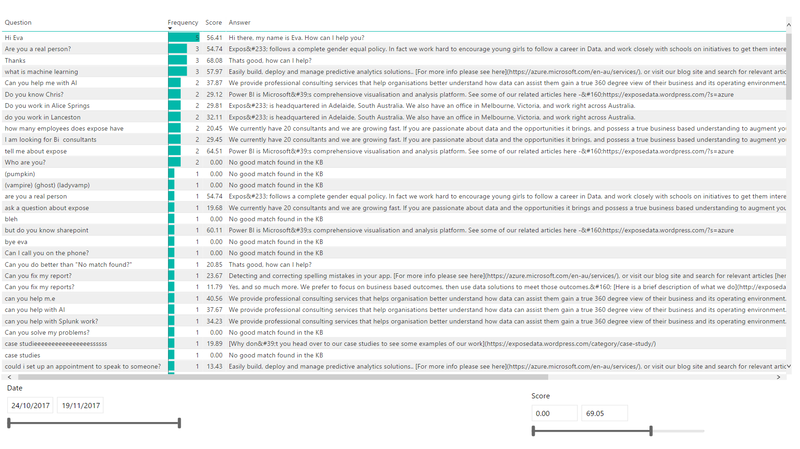 The Microsoft bot framework is a platform for building, connecting, testing and deploying intelligent and powerful bots. The bot framework works by providing a tool that allows you to bring together all the Microsoft bot related technologies together; easily and efficiently. The core foundation of this framework is the Azure Bot Service. The Azure Bot Service manages the desired interaction points, natural language processing tools and data sources. This means that all of the interactions go through the bot service before they make use of any natural language or cognitive toolkits, while also using these interactions to utilise information for a variety of data sources; for example Azure SQL Database. In figure 1, “John” interacts with the Bot Service via a channel (that thing they use to communicate with the Computer in Natural Language). Many readers will already have used Skype and Slack to interact with other humans. They can now use this to interact with Computers too. John is essentially asking about Thongs, its availability and ends up with all the information he needs to buy the product. 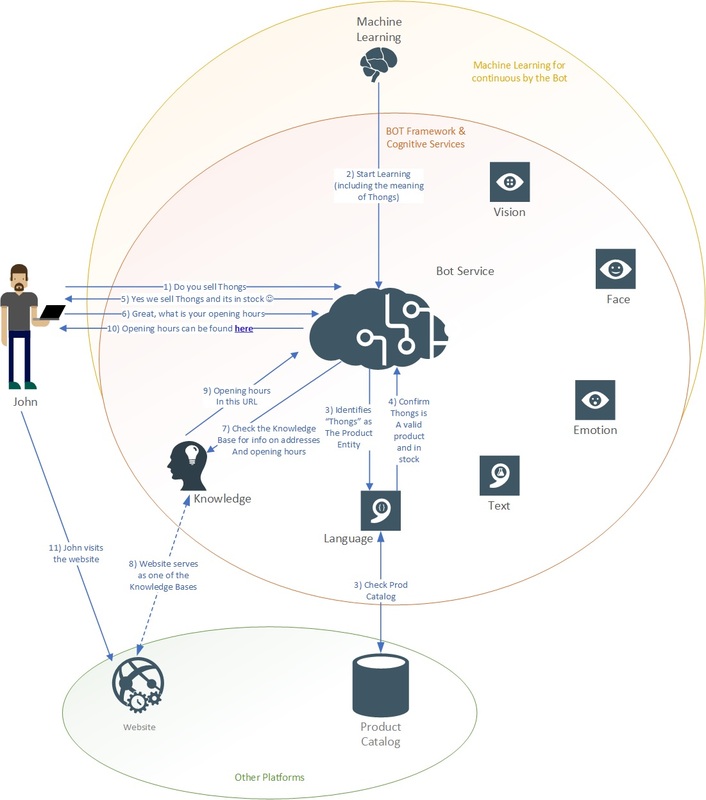 The Bot framework interacts with the broader Cognitive Services APIs (in this example Language Understanding and Knowledge Base) and various external sources of information, whilst Machine Learning continually learns from the conversation. A council ratepayer interacts with the council’s bot via the council website and asks for information on the rubbish collection. At this point, the bot will simply refer to a particular knowledge base, and in addition other sources of information such as the website, an intranet site or a database. The bot’s response is at this stage informative. A response could, for example, be, “Rubbish is collected each week in Parkside on Friday mornings between 530am and 9am. General waste must go in the red bin and is collected each week. Recyclables in the Yellow bin and Garden Waste in the Green bin is alternated each week”. The user realizes he has no Green bin and so asks the bot where one can obtain a Green bin. The bot now uses Language Understanding APIs and picks up the words “where can…be obtained” as the user’s intent, and “Bin” and “Yellow” as entities (that could easily also have been “Green Bin” or “Rates Bill”, etc.). This invokes an interaction with the council’s Asset application and an order of the Asset required, and likely also any financials that go with it through the Billing system. The question, therefore, leads to a booking and a delivery and bill; all without having to visit or call the council office and no on-hold telephone waits. Who is our own Eva? If you browse to the Exposé website, http://exposedata.com.au/, you will meet Eva if you select “Chat with us now”. Eva was initially (Eva version 1) built to act as an intermediary between the website visitor and our knowledge base of questions and answers. She is a tool that allows you to insert a series of questions and she returns answers. She learns from the questions and the answers using machine learning in order to improve the accuracy of responses. The net result is users spending less time searching for information on our website. Eva version 2 was meant to solve our main pain point – what happens if the content on the web (or blog) site changes? With Eva version 1 we would have had to re-train Eva to align with new/ altered content. So, in version 2 we allowed Eva to dynamically search our WordPress blog site (this is where most of the content changes occur) so as to better answer user questions with up-to-date information. And if the user’s question could not be answered, then we log this to an analytics platform to give us insight as to the questions visitors are asking. In addition, we trained a language model in Microsoft Language Understanding Intelligent Service (LUIS) and built functionality inside of the Azure bot service to utilize functionality from the WordPress Exposé blog. An example of an interaction with Eva can be seen below. As there are a few blogs that involve videos Eva will identify the videos and advise the visitor if there is a video on the requested subject. 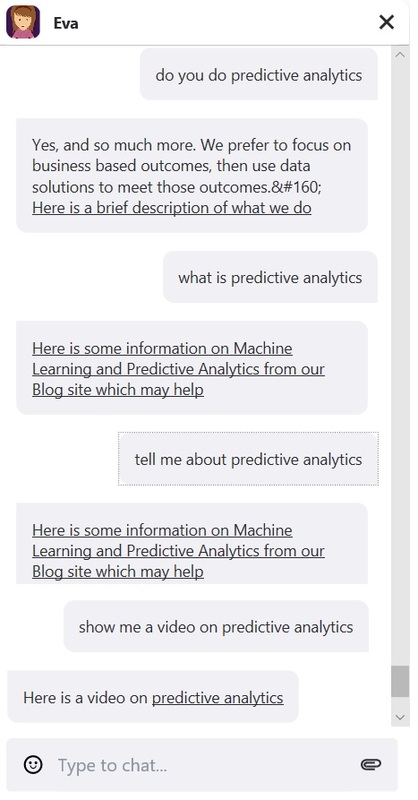 Eva clearly found a video on predictive analytics on the blog site and so she returns a link to it. But she could not find anything on cats (we believe everyone loves cat videos 😊) and informs the visitor of this gap. She then presents the visitor with an option to contact us for more information. Go and try this for yourself, and try and replace "predictive analytics" with any of the topics below to get a relevant and contextual answer. Eva is ever evolving and she will soon become better at answering leading chained questions too. 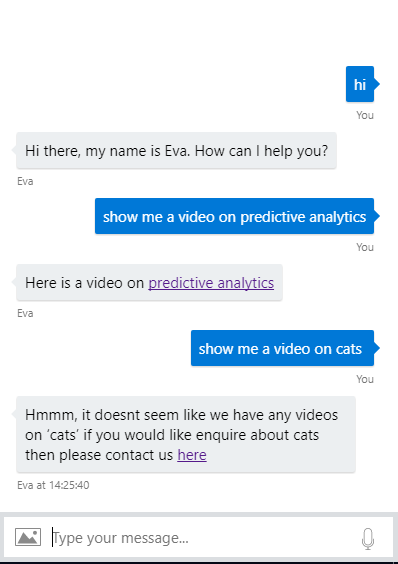 GOTCHA: Eva was developed whilst the Azure Bot Service was in preview, but Bot names must now contain at least 4 characters. Often technology that looks appealing lacks a true business application. But as you have seen from the example with Eva, we asked her about a video on a particular topic. Imagine using your intranet (e.g. SharePoint), data held in a Database or even an operating system as a source of information for Eva instead to interact with.